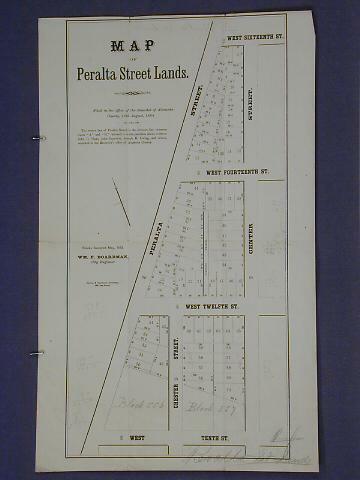 The lots shown on this map front on Peralta St., Chester St. West Tenth St., West Twelfth St., West Fourteenth St. West Sixteenth St., and Center St. Peralta St. and Center St. converge to form an acute angle between 17th and 18th Sts. "Blocks surveyed May, 1868, Wm. F. Boardman, City Engineer." "The center line of Peralta Street is the division line between tracts "A" and "B," referred to in the partition deeds between John C. Hays, John Caperton, Joseph K. Irving, and others, recorded in the Recorder's office of Alameda County."